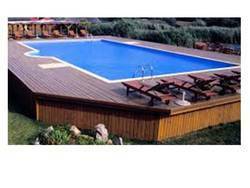 Manufacturer of a wide range of products which include above ground pool. Known for our credibility in the market, we are providing an extensive assortment of Above Ground Pool. These budget friendly pools are easy to install and requires less maintenance. These pools are equipped with an anti-skid floor, anti-slip steps, and sturdy sidebars. These are designed with utmost care and precision by our expert professionals using the supreme quality material to maintain the standards laid down by the industry. They are available in various sizes, shapes and specifications at the most affordable rates in the market.